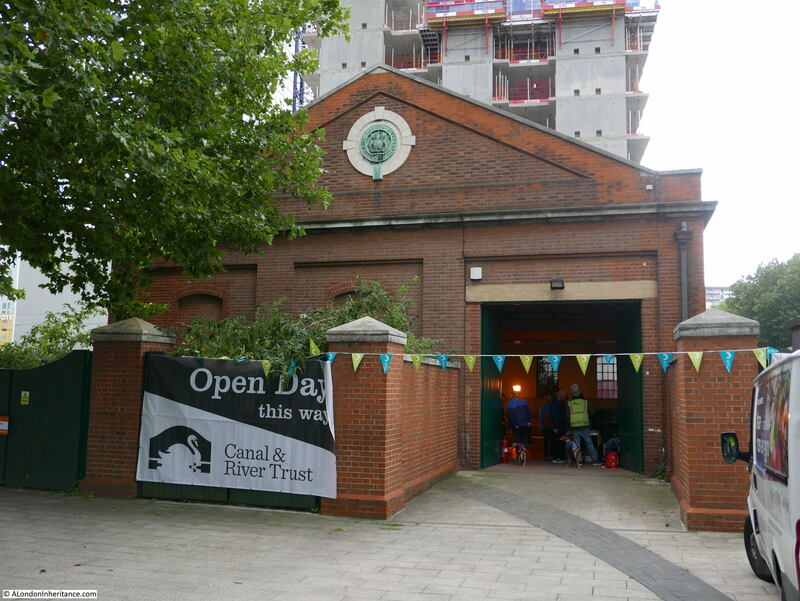 Last weekend was the annual Open House event across London, two days when it is possible to visit so many locations across the city that are not normally open. I only had Sunday free this year, and planned a walking route that would take in five locations that I have walked past many times, but never had the opportunity to see inside. 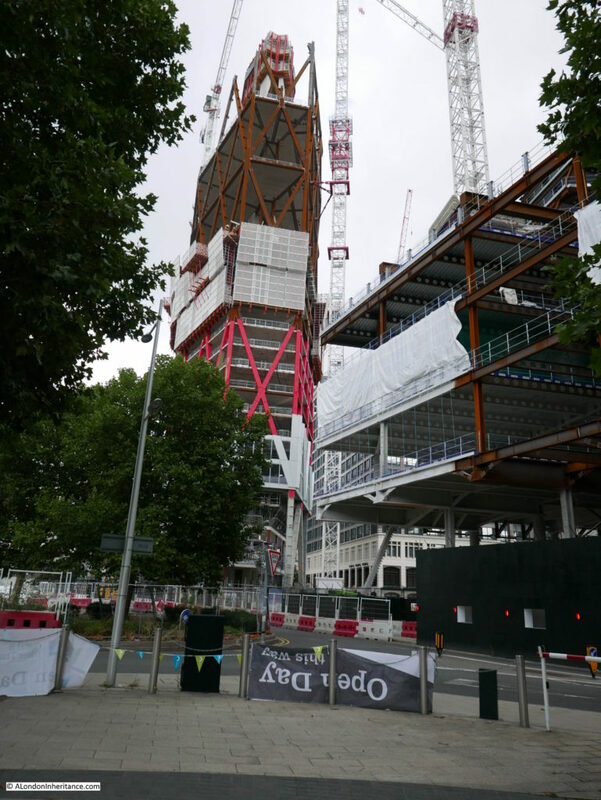 The Isle of Dogs has, and continues to undergo, significant development. The first building on my OpenHouse list is a low brick building between Marsh Wall and Westferry Road, surrounded on almost all sides by massive building sites. 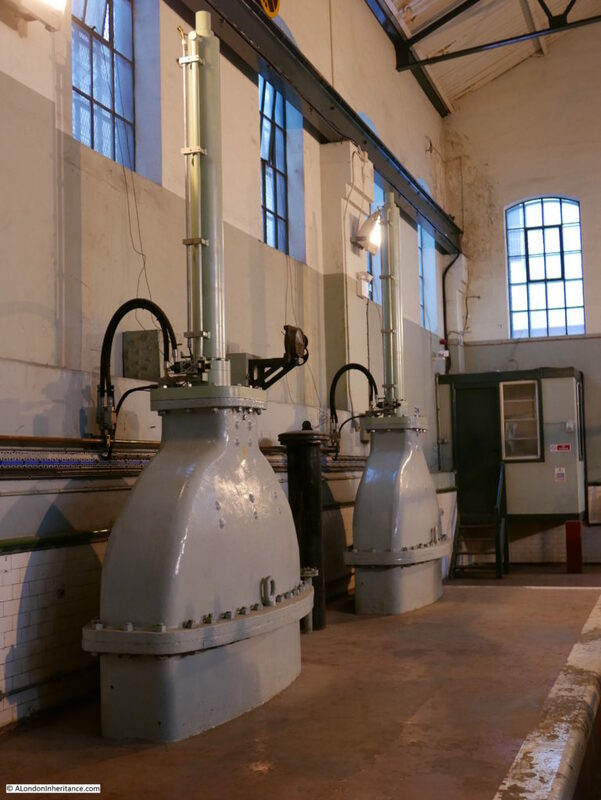 This unassuming building is the West India Dock Impounding Station and since 1929 has provided the critical function of maintaining the water levels in the West India Dock complex and helping to reduce the build up of silt. The complex of interconnected docks (West India Dock Import, Export and the South Dock) form a large expanse of water. From the opening of the docks it was a challenge to keep the docks from silting up. Opening of the lock gates between the docks and river would frequently bring in a large quantity of water carrying silt which would be deposited across the docks. The water level would also change. 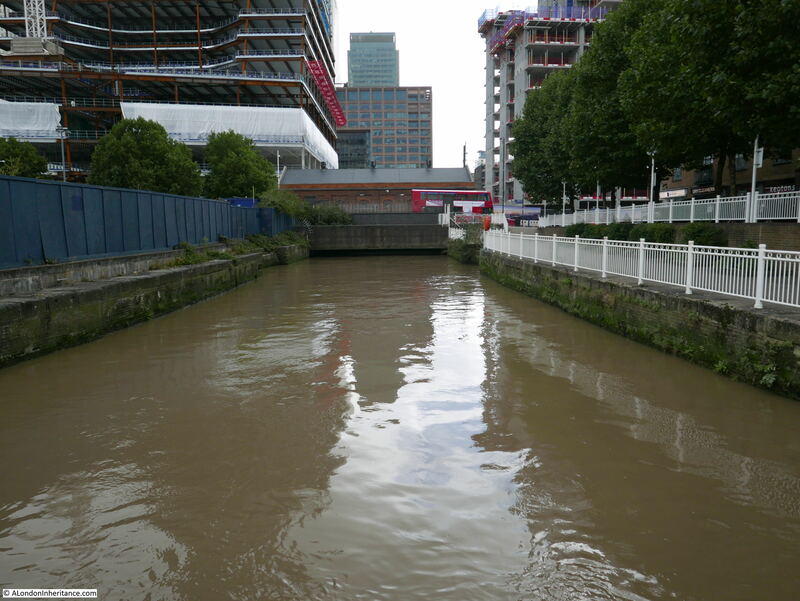 As well as the inflows and outflows when the lock gates were open, there was also evaporation from the large surface area of the water, as well as leakage through the walls and base of the docks. 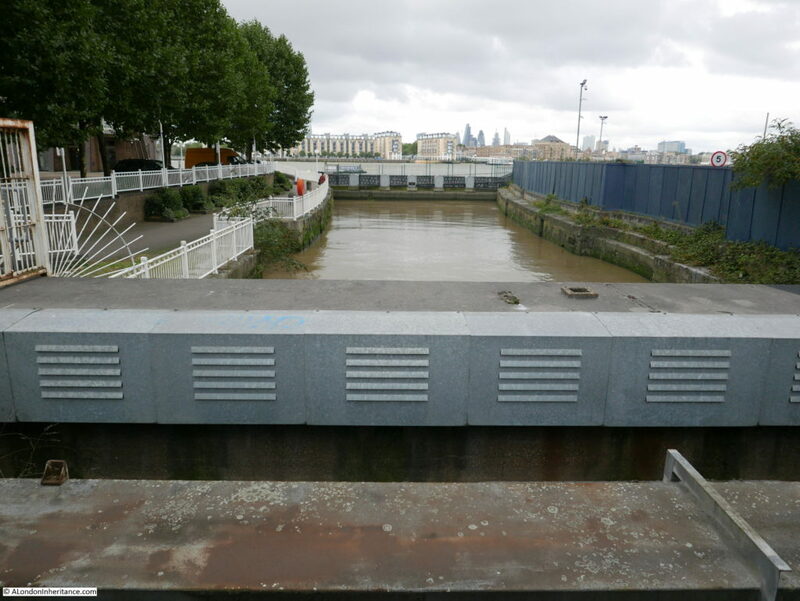 The docks needed to be frequently dredged and there was an early attempt at a system to manage the flow of clean water into the docks built where Poplar Dock is now located, but these methods did not work well, or offer a long-term, cost-effective solution. Plans for a new impounding station (impounding means the replenishment of a reservoir and in the case of the docks, the management of water into the docks) were ready in 1913, however construction of the new station did not start. Modified plans were ready in 1921 and between 1926 and 1929 the new impounding station was built across the disused western entrance to the South Dock. This view is from Westferry Road, looking along the disused entrance to the South Dock out towards the River Thames. 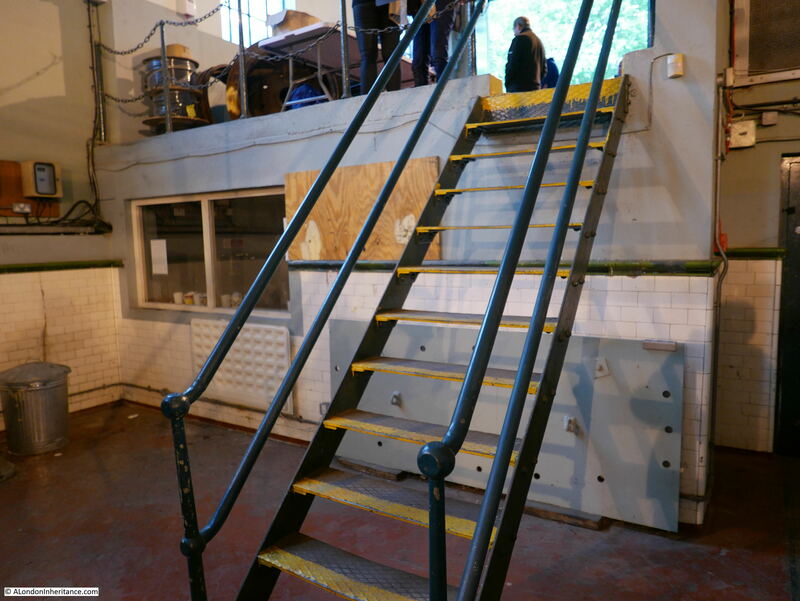 The entrance now provides the water intake from the river to the pumps in the impounding station. Externally, the building appears to be a simple, brick building with no hints of what could be inside. What does make the building stand out today, is that it is one of the very few surviving buildings in this area from when the docks were operational. So much has been demolished over the past decades. The isle of Dogs was heavily bombed in the last war, but the building also survived intact throughout this period. 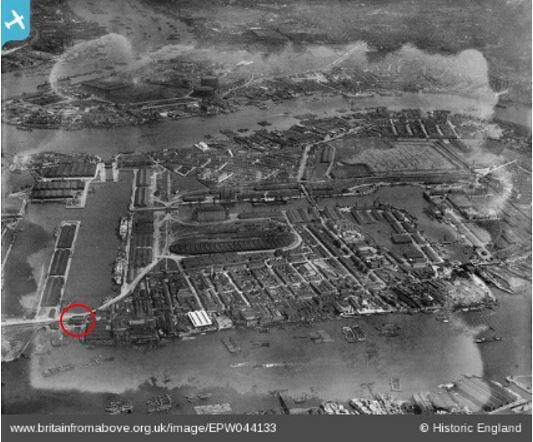 I searched through photos of the area on the Britain from Above web site and found the following photo from 1934. The West India Export Dock is on the left of the photo, and to the right of this dock is the South Dock. 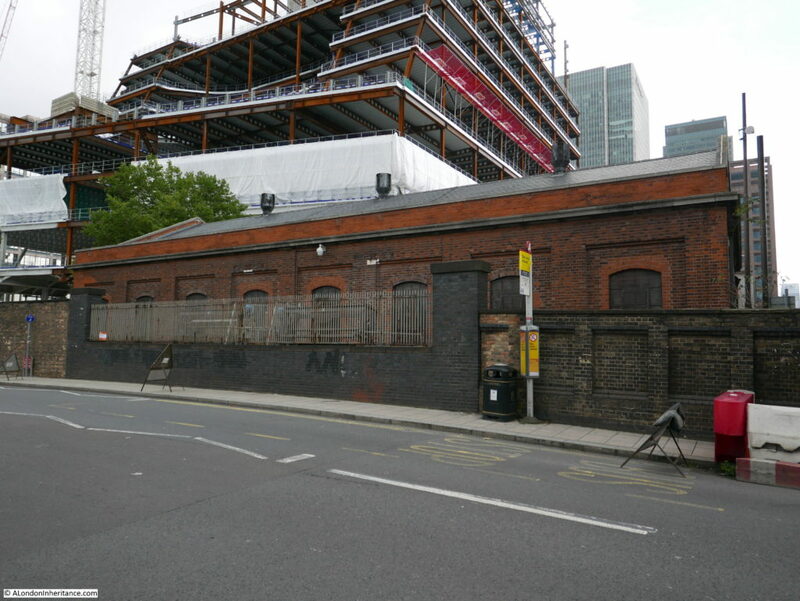 The West India Dock Impounding Station had been completed five years before this photo was taken and is just visible between the South Dock and the river. The red circle surrounds the building. 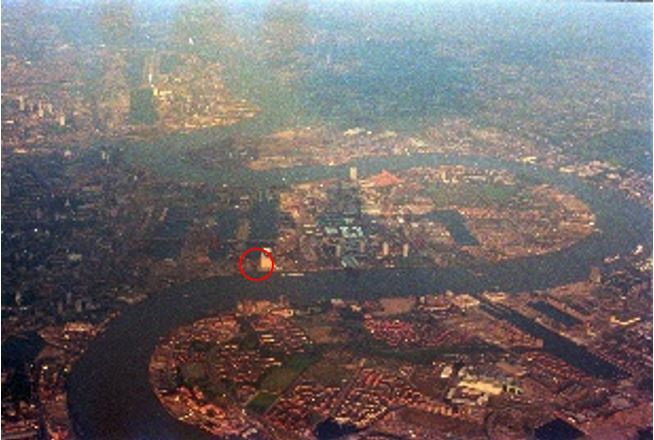 To show the overall expanse of water that was topped up by the West India Dock Impounding Station, I took the following photo during a flight over London in the early 1980s. I have again circled the location of the building. the South Dock is behind the building, the West India Export and Import docks are to the left. 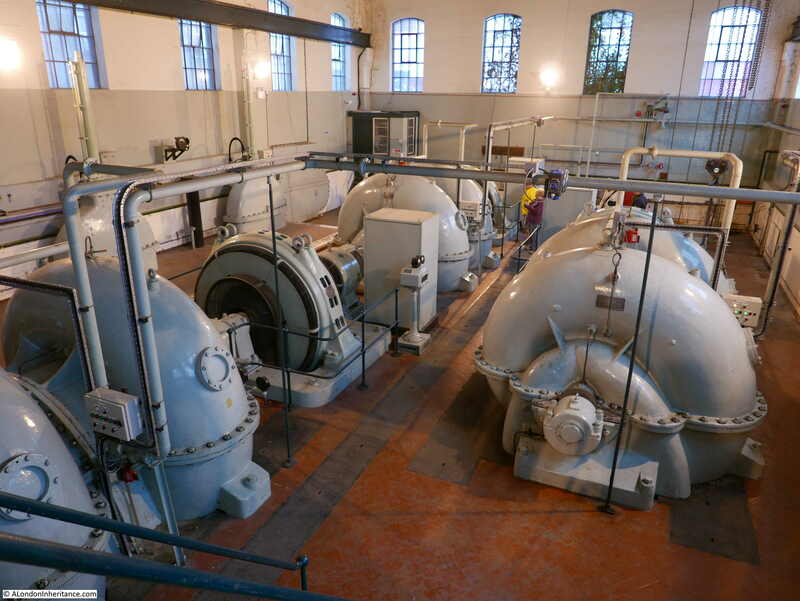 The building is slightly deceiving from the outside in that the machinery is all below ground level which is apparent on entering the building and looking down on the three large pumps and their associated electric motors that occupy the floor of the building. The photo below shows the drive between the electric motor and the pump. 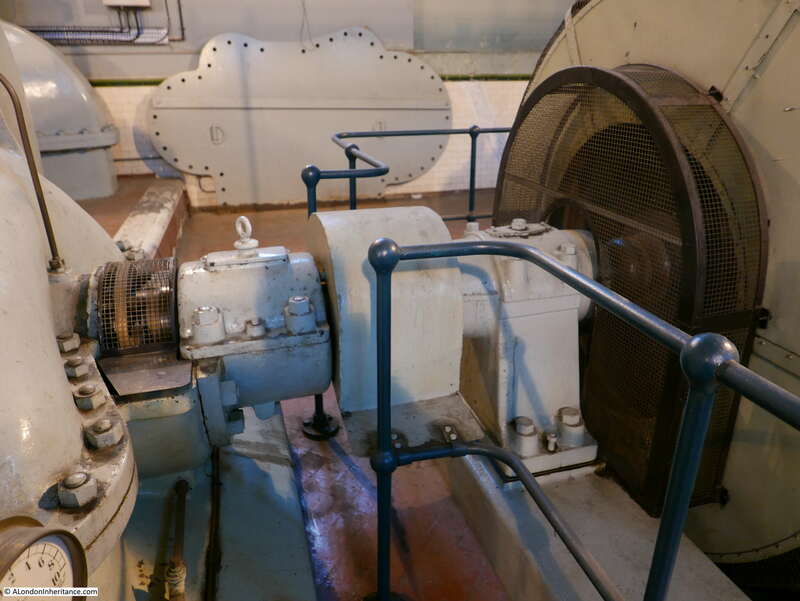 The large boards resting up against the wall at the back of the photo are blanking panels inserted across the lower half of the pump when the top half is removed to gain access to the impeller. 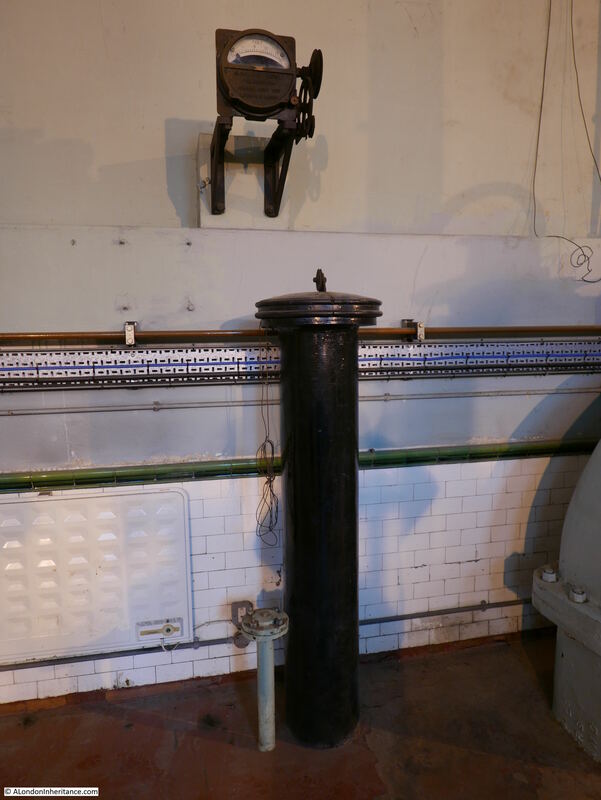 Without sealing the pumps, water would escape into the building, which it did in the 1970s causing a minor flood in the building. 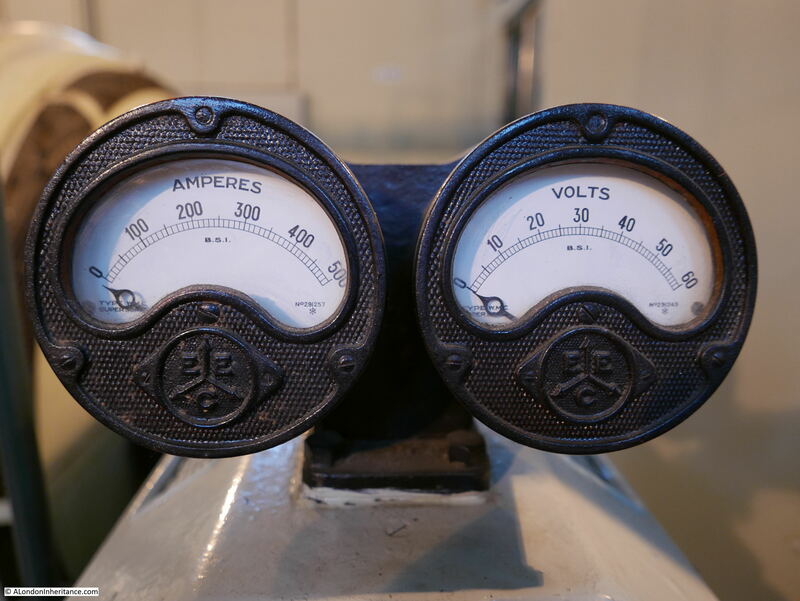 The pumps only operate when water needs to be transferred into the docks, so they do not run all the time. Generally only one pump is needed, the three pumps provide a level of redundancy to ensure that the impounding station can still work even with two pumps out of service for maintenance or repair. 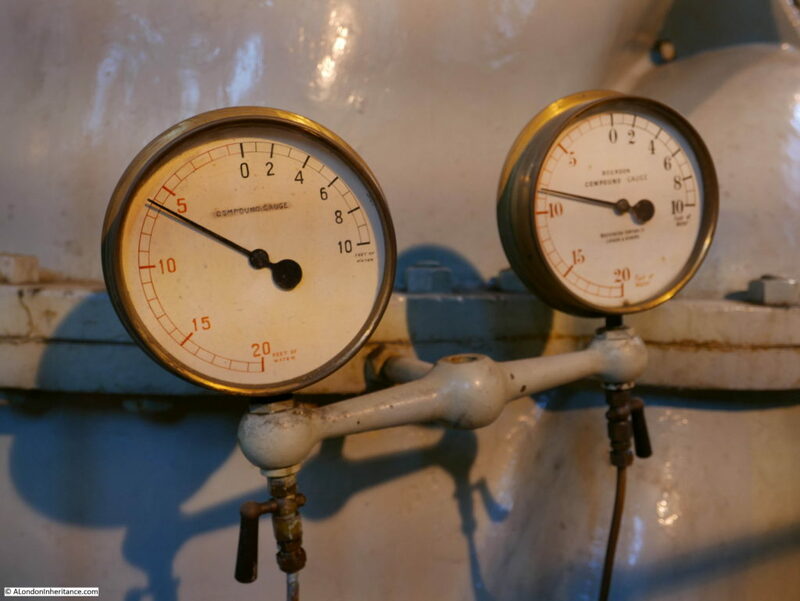 Each of the pumps consists of three main parts. In the photo below are the electrical motors. On the left is the smaller starter motor which generates sufficient torque to get the larger motor and pump moving and on the right is the large motor which drives the pump. 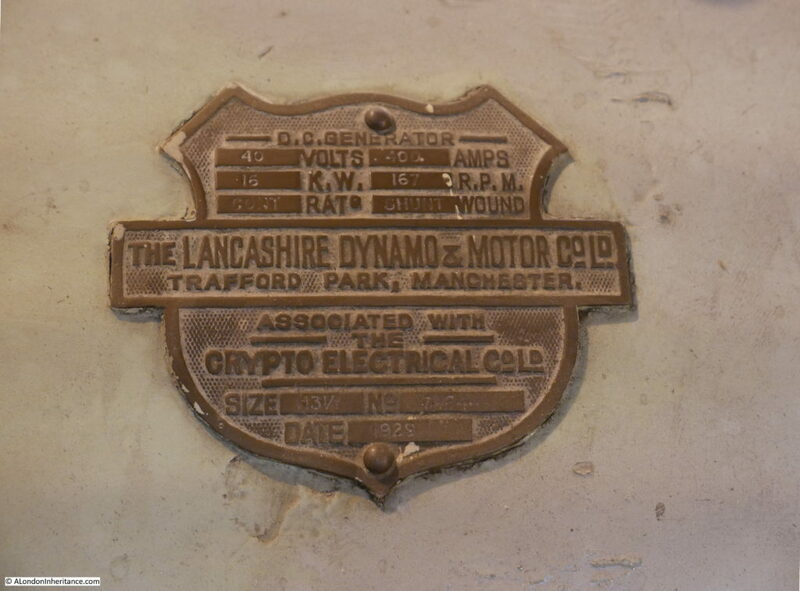 The box to the left of the starter motor is full of resistors used to absorb excess electricity generated by the starter motor when the main motor is running. 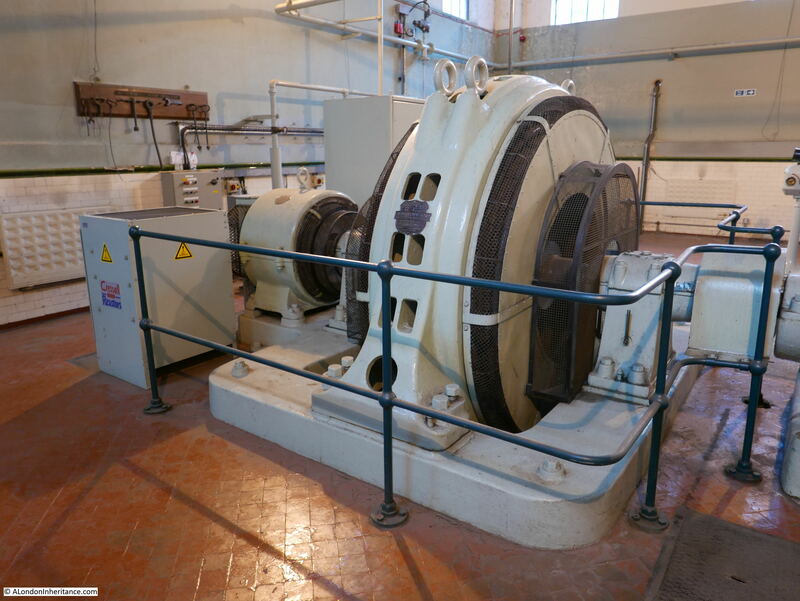 The electric motors drive the impellers which are housed in these large doughnut shaped pump housings. Water is drawn in from the Thames via the old inlet to the South Dock, and through a wire mesh which traps items floating in the water from being drawn into the pumps. 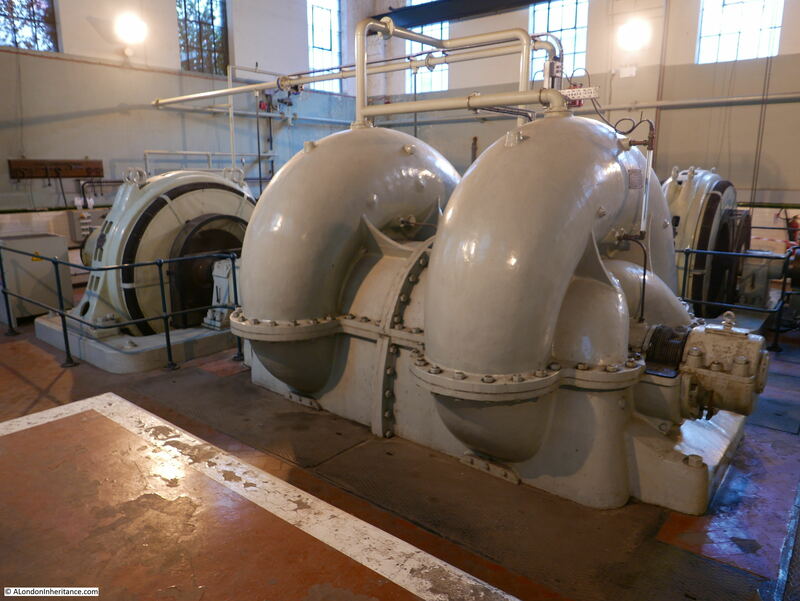 For each pump, there is a large blade that opens or closes the flow of water into the South Dock. The following photo shows two of these. When open, the blade is retracted into the large metal housing above floor level, when closed the blade is lowered to block the flow of water in the pipes below floor level, from the pump into the South Dock. 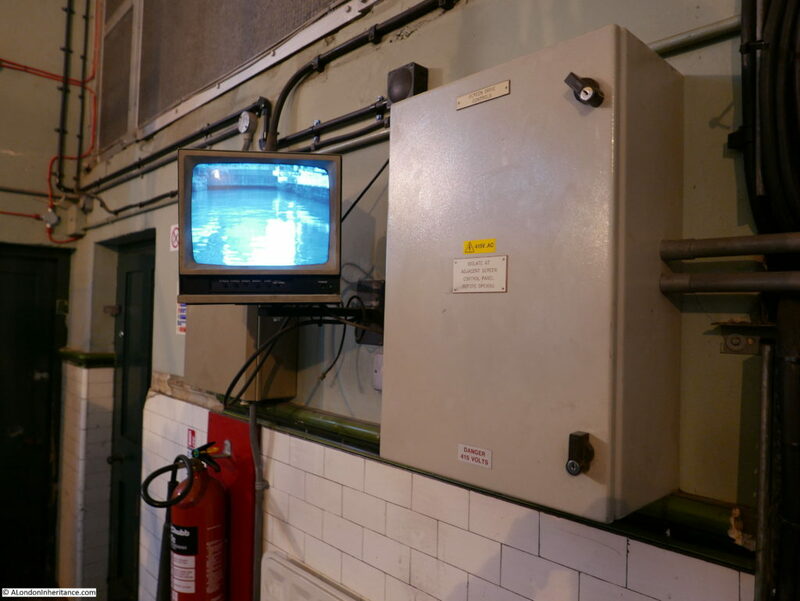 Monitoring water levels and control of the pumps is now mainly automated, however some of the original monitoring equipment is still in place. The photo below shows the original water level monitor. Water would rise up and down the large black pipe. 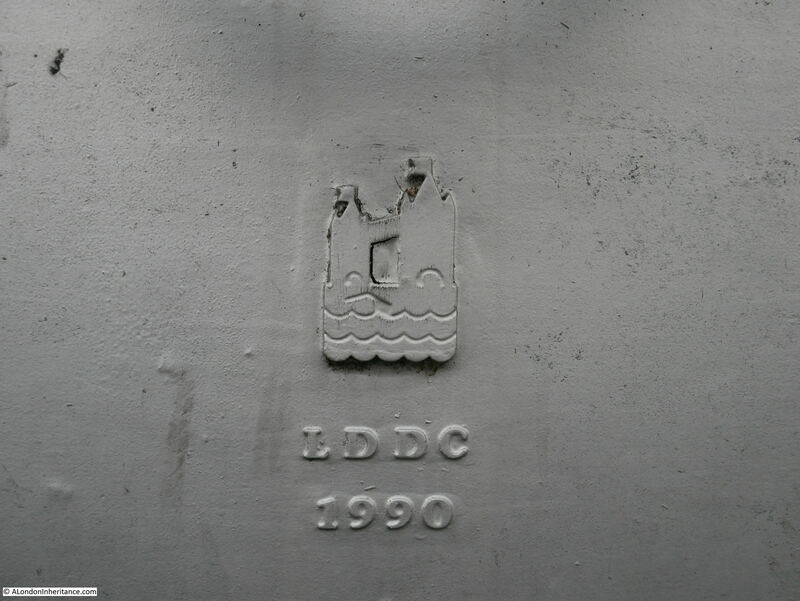 A float on the top of the water column was connected by a cable to the gauge on the wall above. The water level on the inlet from the river is monitored automatically, however a monitor also provides a view of the inlet. As I mentioned earlier in the post, the West India Dock Impounding Station managed to survive the blitz and the significant bomb damage that devastated much of the Isle of Dogs. The building included an air raid shelter for the workers in the form of a heavily protected room at one end of the building. This can be seen in the photo below with the thick concrete layer between the room and the entrance level above. I was really surprised to learn that the West India Dock Impounding Station is not listed. Given the amount of building on the Isle of Dogs where any spare land seems to either be occupied by a recent build, or is currently a construction site this is a real worry. The building seems surrounded by over bearing building sites at the moment which are very visible on leaving the building. I can only hope that in a world which seems to know the price of everything and the value of nothing, the building is protected from the developments which seem to be covering much of this area. After leaving the West India Dock Impounding Station. I crossed over Westferry Road to the Thames path and crossed over the inlet from the river. 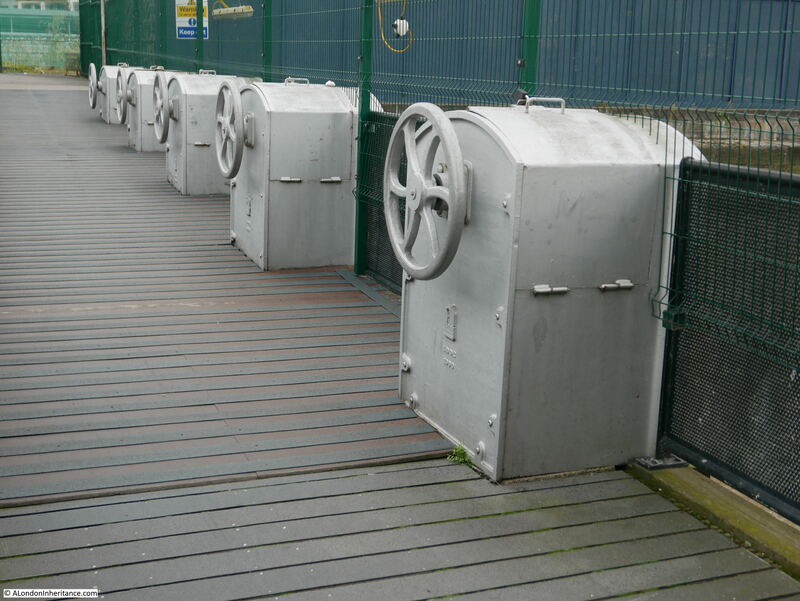 Five large wheels control the opening and closing of the inlets to the Thames. Each with a reminder of the old London Docklands Development Corporation. A final look back along the inlet towards the West India Dock Impounding Station. 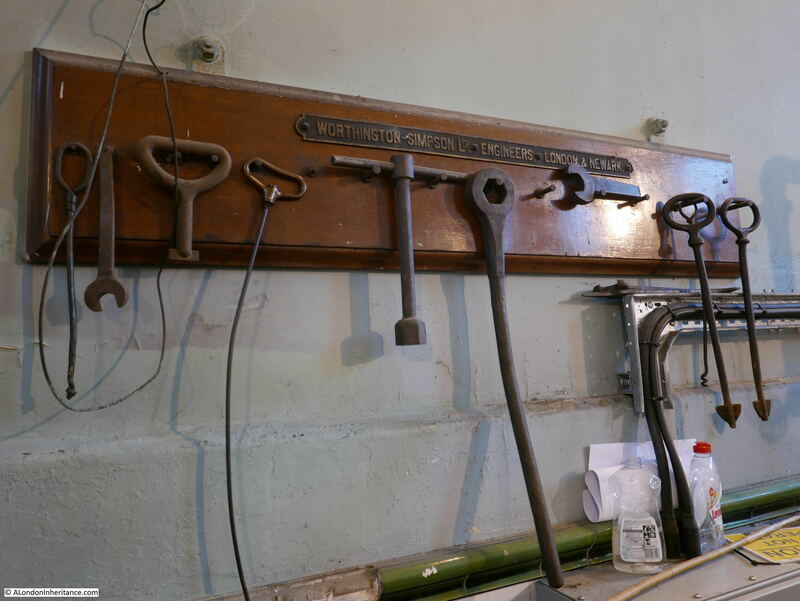 The opening of the West India Dock Impounding Station for Open House was organised by the Canal & River Trust and their guides were incredibly knowledgeable about this historic building. Despite not being listed, I hope that the building will be protected in the future and continue to manage water levels across the docks using the original machinery within the 1929 brick building. Now off to Limehouse for two more OpenHouse locations which I will cover in my next post. This entry was posted in The Thames and tagged Isle of Dogs, West India Dock on September 20, 2017 by admin.